Life passes quickly, especially when you’re a dog. The frolicking puppy brought home from the humane society just a few short years ago matures into a mellow senior in what seems like the blink of an eye. Fortunately, as veterinary medicine has improved, so has our ability to identify and manage some of the most common health conditions associated with aging in dogs. As veterinary medicine has improved, so has our ability to identify and manage health conditions. Here are 5 senior dog diseases you need to know. When is my Dog a 'Senior'? Although the common wisdom tells us a dog’s age times 7 equals their equivalent age in human years, the truth is dogs age at different rates depending on their size. Giant breeds like Great Danes may have a life expectancy of less than 10 years, while an eight pound Chihuahua may live past 18. A more specific rule of thumb is that a dog can be considered a senior during the last quarter (25%) of his or her expected life span. 1. Osteoarthritis: Joint disease goes hand in hand with aging, as the cartilage that protects joint surfaces wears down with time. Although this process cannot be reversed, owners have plenty of tools at their disposal to reduce the impact of aging on joints and arthritis in dogs. First, make sure your pet is at a healthy weight. Overweight dogs carry significantly heavier loads on their joints. This has an effect on dogs of all breeds, but is most pronounced in large breed dogs who may already have a genetic disposition to conditions such as hip dysplasia. Second, make sure your dog receives regular examinations to catch the early signs of joint disease. Familiarize with the signs of joint disease, too — reluctance to climb stairs, stiffness especially in the morning, and limping to name a few. Last but not least, ask your veterinarian about therapeutic dog food. Some diets are formulated specifically to improve mobility and joint health. 2. Dental Disease: One of the most commonly diagnosed conditions in dogs, dental disease occurs in all breeds and sizes of canines. Left untreated, periodontal disease can lead to pain, tooth loss, and bacteria in the bloodstream that can damage internal organs. Home care such as tooth brushing and dental treats can help reduce tartar on the teeth, as can specialized foods meant to promote dental health. Once dental disease has developed, however, a fully anesthetized dental cleaning at the veterinary clinic in needed. Start early, before severe periodontal disease develops. 3. Obesity: More than half the dogs in the United States are classified as overweight or obese, and many owners don’t even realize it. Even worse, overweight dogs are susceptible to a litany of secondary problems such as joint disease, diabetes, and respiratory illness. Exercise and calorie control are the keys to managing a pet’s weight. Senior dogs are often less active than their younger counterparts and have different caloric needs. Diets designed for seniors can help provide nutrients in the proper balance, often with different ratios of fat and protein than you would find in a standard adult dog food. Regular gentle exercise is beneficial even for dogs with health issues. Consult with your veterinarian to come up with a diet and exercise plan that is right for your pet. 4. Hypothyroidism: Overweight dogs that are following a vet-approved weight loss plan with little to no success may be suffering from hypothyroidism, a common condition in dogs that results in a sluggish metabolism. Fortunately, hypothyroidism can be diagnosed with a simple blood test and responds readily to medication. 5. Cancer: Sadly, dogs are susceptible to many of the same cancers seen in humans. Hemangiosarcoma, lymphoma, and mast cell tumors are just a few of the neoplasms commonly diagnosed in dogs via ultrasonography. Although there is a strong genetic component in some dog breeds like Golden Retrievers and Boxers, cancer can develop spontaneously in any breed. Early detection and diagnosis is the key to surviving dog cancer, so don’t skip those annual veterinary exams. A five-year-old neutered male Domestic Shorthair cat was presented with an acute history of anorexia and vomiting. Physical examination revealed a painful cranial abdomen. A complete blood count and blood chemistry profile were normal, and abdominal radiographs were unremarkable. Abdominal ultrasound revealed a spastic duodenum (Figure 1), an enlarged, irregular, hypoechoic pancreatic body (Figure 2) and a hypoechoic left pancreatic lobe (Figure 3), as well as hyperechoic surrounding mesentery which surrounded the body and left pancreatic lobe. The cat responded well to medical management of pancreatitis with intravenous fluid therapy, famotidine and pain medication. Pancreatitis is inflammation of the pancreas and it can be acute (sudden) or chronic (recurrent) in nature. It is associated with a range of clinical signs that vary in severity, often overlapping with signs of acute gastroenteritis, inflammatory bowel disease, gastrointestinal obstruction, peritonitis, or acute renal failure. Therefore, ultrasound is a very useful diagnostic tool to help differentiate among these similar presenting conditions. The cause of pancreatitis in dogs and cats is usually unknown. 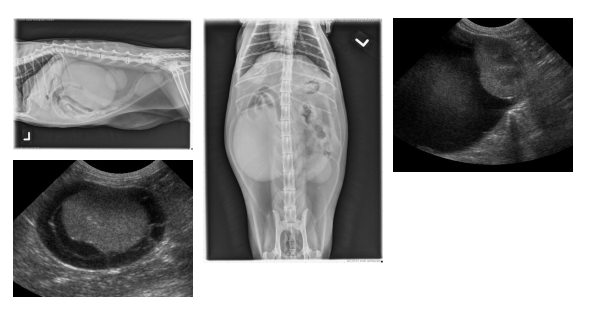 This is a case is a 13-year-old female spayed domestic short haired cat with history of hematuria (blood in the urine). ​The right kidney is markedly enlarged, with a rounded shape. It is distorting the abdominal wall on the v/d projection and displacing the ascending and transverse colon medially and ventrally. The left kidney also has an abnormal shape, with reduced length and increased width. There is also spondylosis deformans at the L5-6 intervertebral disc space, which is an incidental finding. On ultrasound images, both kidneys were surrounded by large cystic structures filled with echogenic fluid. There are fine septae visible in the pseudocyst surrounding the left kidney. Drainage of both collections of fluid were clear and colorless except for the last 15 ml from the right kidney, which was hemorrhagic. Both kidneys were small and irregular with poor corticomedullary distinction. Bilateral perinephric pseudocysts and chronic renal disease. Perinephric pseudocysts are associated with chronic renal disease, but are often asymptomatic. The association between the pseudocysts and this cat’s hematuria is unclear. The hematuria may have been due to pressure from the pseudocysts, or idiopathic in nature. New research may lead to more effective ways to control the brown dog tick, a species that can cause major problems for dogs and their owners. University of Florida scientists say they found that the brown dog tick is resistant to permethrin, a widely used anti-tick chemical. They also found that carbon dioxide seems to be an effective way to lure ticks to bug traps. Unlike other ticks, the brown dog tick can complete its life cycle indoors. One female brown dog tick can lay up to 5,000 eggs in its lifetime, the researchers said. The bugs hide in hard-to-reach places. Some dog owners take desperate steps to be free of these ticks. These steps may include giving away their dogs, fumigating their homes, throwing out many possessions, or even moving, the researchers said. "They're particularly troublesome for people who have cluttered homes, and they drive some homeowners to desperate measures in search of ways to control the tick," Phil Kaufman, an associate professor of veterinary entomology at the University of Florida, Gainesville, said in a university news release. "Eliminating places where ticks live and breed is one of the best practices for tick control." Because the researchers found that the ticks are resistant to permethrin, pet owners and pest control companies should use the chemical fipronil. This anti-tick chemical should work in most cases, the researchers said. However, dog owners should watch for loss of effectiveness with fipronil. An indication that fipronil isn't working is seeing ticks that appear to be alive and swelling within the month after treatment, the researchers said. In addition to using pesticides, the researchers said vacuuming can help control ticks, too. The finding on carbon dioxide suggests it may be possible to lure ticks from their hiding spots in nooks and crannies throughout the house to one location. This makes it easier to control them, according to Kaufman. The results were published recently in the Journal of Medical Entomology. The jaundiced/icteric pet has a yellow color in the gums and whites of the eyes.The spleen enlarges as it finds itself processing far more damaged red blood cells than it normally does. The liver is overwhelmed by large amounts of bilirubin and the patient becomes jaundiced (icteric), which means her tissues become a yellow/orange color. The jaundiced/icteric pet has a yellow color in the gums and whites of the eyes. Illustration by Wendy Brooks.Your pet is obviously weak. She has no energy and has lost interest in food. Urine is dark orange or maybe even brown. The gums are pale or even yellow-tinged as are the whites of the eyes. There may be a fever. You (hopefully) brought your pet to the veterinarian’s office as soon as it was clear that there was something wrong. The anemia may be seen on a full blood panel sent to a reference laboratory. These laboratories perform a test called a hematocrit, which is slightly different from a packed cell volume but essentially measures the same thing: the percentage of blood volume made up by red blood cells. This number should be 43 - 59 for dogs and 29 - 50 for cats. These findings indicate the anemia is responsive. This means either red blood cells are being lost through bleeding, possibly internal bleeding, or they are being destroyed by the immune system. If no response at all is seen with corticosteroids, supplementation with stronger immune suppressive agents is necessary. The two most common medications used in this case areazathioprine and cyclophosphamide. These are serious drugs reserved for serious diseases. Follow the links above to read more about specific side effects, concerns, etc. Cyclosporine is an immune-modulator made popular in organ transplantation technology. It has the advantage over the two above medications of not being suppressive to the bone marrow cells. It has been a promising adjunctive therapy in IMHA but has two major problems: first, it is extremely expensive and second, blood level monitoring is necessary to ensure that the dosage is appropriate. This adds dramatically to the expense of treatment but ultimately may provide results not possible with other drugs. 77% were Direct Coombs' positive. Hypertension, more commonly referred to as high blood pressure, occurs when the cat's arterial blood pressure is continually higher than normal. When it is caused by another disease, it is called secondary hypertension; primary hypertension, meanwhile, refers to when it actually is the disease. Hypertension may affect many of the cat's body systems, including heart, kidneys, eyes, and the nervous system. The cause of primary hypertension in cats is not known. However, it may have a genetic component. So how prevalent is this form of hypertension? Studies have varied, but one study found that 65 percent of cats with chronic renal failure and 87 percent of cats with hyperthyroidism had mild high blood pressure. Ages of cats with hypertension ranged 4 to 20 years old. Diabetes may also be a cause for hypertension, although it is uncommon in cats. If you suspect that your cat is suffering from hypertension, bring it in so that your veterinarian may provide a proper diagnosis. Blood pressure is often measured in pets in the same manner as in humans. An inflatable cuff will be placed on the cat's paw or tail, and standard blood pressure measuring instruments will check the pressure. It is important to keep the cat still long enough to get an accurate reading. Five to seven measurements are generally taken. The first measurement will be discarded, and the cat's excitement level during the procedure will be taken in account. If the results are in dispute, the procedure will need to be repeated. The underlying cause of the high blood pressure will be treated first. Otherwise, the cat will probably be on medication to control the blood pressure indefinitely. The medication of choice is either a calcium channel blocker or a beta-blocker. As to cat's diet, the veterinarian may recommend food that are lower in sodium. Blood pressure should be checked regularly, and some lab tests may be ordered by your veterinarian to measure your cat’s reactions to the medication. Foundation For Feline Renal Research, the only 501(c)(3) nonprofit foundation dedicated exclusively to the understanding and treatment of feline kidney disease, is pleased to announce a $20,000.00 grant to the Royal Veterinary College, London, in support of their groundbreaking study "Unravelling The Genetic Basis for Blood Pressure and Kidney Function In the Cat". This important work, which is starting now, will be led by Dr. Rosanne Jepson, BVSc (Dist) MVetMed PhD DipACVIM DipECVIM MRCVS and Dr. Jonathan Elliott, MA, Vet MB, PhD, Cert SAC, Dip ECVPT, MRCVS. Kidney disease is one of the biggest killers of companion cats; it causes great pain and suffering, and there is no cure. As many as one in three cats will ultimately develop the disease. The goal of this study is to isolate and analyze genes that influence renal disease and hypertension (the two diseases often go hand in hand). According to Dr. Jepson, "Kidney disease is one of the most common conditions that we see in ageing cats. Some of these cats also develop high blood pressure (hypertension) which can result in damage, particularly to their eyes, and can lead to blindness. We know that, in human medicine, there are genes that are involved in both kidney disease and hypertension. At the Royal Veterinary College we have been studying these conditions for over 20 years. Thanks to the funding provided by Foundation For Feline Renal Research, we are now in a position to use newly developed cutting edge technology to look for gene associations in almost 1000 cats. As far as we know, this will be the first and largest study looking at genes associated with kidney disease and blood pressure in older cats. It's really exciting to be starting new work that we hope will expand our knowledge of both of these important conditions." This humane study utilizes DNA from blood samples obtained for diagnostic purposes from companion cats during the course of their regularly scheduled veterinary visits. The samples, after being used for the necessary diagnostic purposes, were preserved for use in this study with the consent of the cats' human companions. Surgery, radiation, and chemotherapy are the more commonly known treatments for cancer in pets. But newer technologies are opening up other possibilities. A recent experiment summary (abstract) suggests the use of genetic modified viruses to treat various types of cancer. The idea of using a virus for cancer treatment or oncolytic virotherapy is not a new idea. In the 1940s scientists conducted animal studies using viruses to treat tumors. Doctors in the 1950s observed that cancer patients that were stricken with viral infections or recently vaccinated experienced improvement in their condition. It was believed that the infections or vaccinations triggered an immune response that increased the production of interferon and tumor necrosis factors, or TNFs. Despite the potential for viral therapy of cancer in these early years, it required the present advances in technology to achieve a real possibility. Precisely, it required our present ability to genetically modify organisms like viruses and safely use them to target cancer cells. The viruses are modified to prevent their normal ability to cause disease and genetically altered to produce interferon or other anti-cancer molecules. The abstract was based on a small study intended to evaluate the safety and effectiveness of a new oncolytic virus. The group was made up of of seven dogs suffering from various cancers (lymphoma, malignant melanoma and multiple myeloma). The researchers used a novel virus for their study; they used a modified vesicular stomatitis virus that causes oral, udder, and hoof ulcers in cattle. Although seldom fatal, the disease causes inappetence and decreased milk or meat production [in cattle]. It can also infect horses and pigs, and rarely, sheep, goats, and llamas. Because of its effect on agricultural production, vesicular stomatitis is a diagnosis that requires mandatory reporting to federal and state animal health officials. The virus was also modified to produce human or canine interferon. Three dogs received the human form and four dogs received the canine form. The abstract reported measurable improvement but did not specify the type and extent of the improvements except for the production of neutralizing antibodies within 7-10 days after viral administration. Side effects were minimal and included reversible changes in liver enzymes, fever, and urinary tract infection. Virus was not shed in the urine or saliva. These limited side effects are comparable or even fewer than those expected with radiation or chemotherapy. This is a small study and rightly titled as preliminary. It has yet to be published so critical evaluation is still not available. Clearly, much more study is required for this type of treatment. What is exciting is that this is one of many new potential treatments for cancer in pets. Advanced cancer treatment in the last decade has changed how the diagnosis is now viewed. Rather than an immediate death sentence, cancer can now be better managed as a chronic disease much like kidney and heart conditions. These new treatments offer greater treatment flexibility and potentially an improved quality of life. The disease is extremely aggressive and has a tendency to spread rapidly into other parts of the dog's body (metastasize). There are treatment options available, but generally the long term prognosis for the animal is poor. Bone cancer can be found in cats as well, but it is rare. Many signs of bone cancer are subtle. They can include swelling, lameness, and joint or bone pain. In some cases, dogs suffering from bone cancer will appear tired or have anorexia. Occasionally, dogs will exhibit a mass growth on their body or a painful inflammation around the sight of the tumor. Current knowledge of the disease has not linked genetics or gender to the condition, but bone cancer does appear more often in large to giant breeds of dogs. Some studies have shown a slight increase in the development of osteosarcoma among dogs that have experienced a blunt bone injury. Your veterinarian will use X-rays to view the mass, often using several angles to get an accurate picture. Other tests include biopsies, blood tests, bone scans, and CAT scans to view the bone areas, and the mass, if discovered. If the diagnosis is bone cancer, it is important to note that the prognosis is often unfavorable and that there are numerous side effects to the treatment options. Management on your part will be required. Chemotherapy is often used as a supplement to any surgical options to ensure that the disease has not spread into other areas of the dog's body, particularly the lymph nodes. In severe cases, limbs may need to be amputated to completely remove the bone cancer. Activity will be restricted following any surgery. A pain management program and medications are frequently prescribed for the animal following surgery. Medications commonly work to manage pain and reduce inflammation. Ongoing management and monitoring of the dog's white and red blood cell counts will be recommended, and chest X-rays are often used to determine remission. There are currently no known prevention methods for bone cancer.